Several weeks ago, we had some out of state family that stayed with us for the week here in Mesa – we had such an amazing time. We visited the Titan Missile Museum in Green Valley, and drove up to see Wutpaki National Monument in Flagstaff. The rest of the week was spent riding go-carts out at Golfland and driving through the windy mountains of Canyon Lake out in Apache Junction. One of the most memorable parts of the visit was visiting a family friend that had recently retired and moved to Arizona – he had a thriving business up in Minnesota until his wife lost her battle with cancer. Now, we lives just outside of Queen Creek in solitude as he struggles to pick up the pieces after what has been a challenging adjustment. Every week, my kids and I bake up dinners for him and take him food – from Pumpkin Bread to grain-free Chocolate Chip Cookies, even Homemade Chicken Noodle. Our goal is to help him through this challenging time, even if that means making food and visiting every week for the next few years. I can’t imagine losing my spouse and spending my life alone in solitude, 2400 miles away from my children – but am hopeful that one day, if I am ever in that situation, someone takes the time to visit with me regularly too. This bread is just one of many things we baked up for him over the weekend – we paired with some more Chicken Noodle Soup – not only is chicken noodle easy, it’s well loved by almost everyone we know. The Instant Pot does all of the hard work and we feed on it’s efforts. This bread is so incredibly easy – just give it time to rest, then rise, then throw in the oven – your house will smell incredibly amazing. 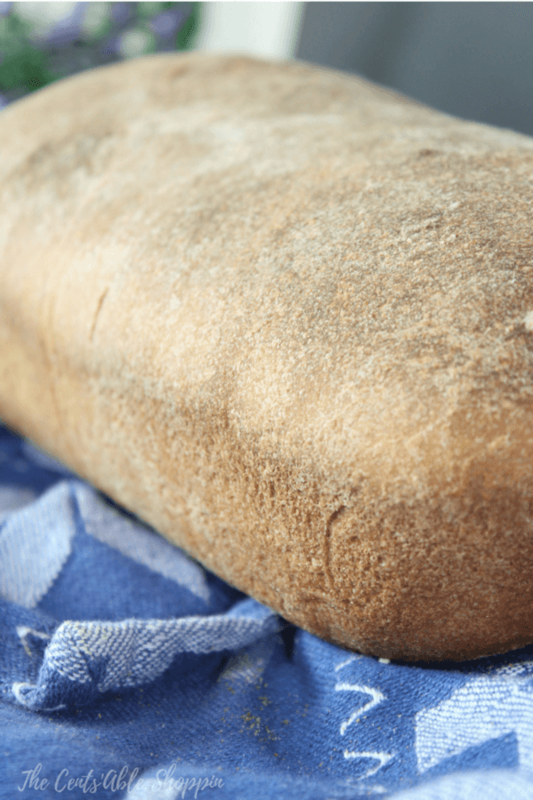 The loaf comes out soft and moist – wrap it up in a little plastic wrap and encourage the recipient to use it fresh with some lettuce for sandwiches, or… toasted with some butter. Grab our Chicken Noodle Soup Recipe here… it’s such a wonderful gift idea. Don’t have Whole Wheat Flour? You can pick up from Vitacost for such an amazing price. 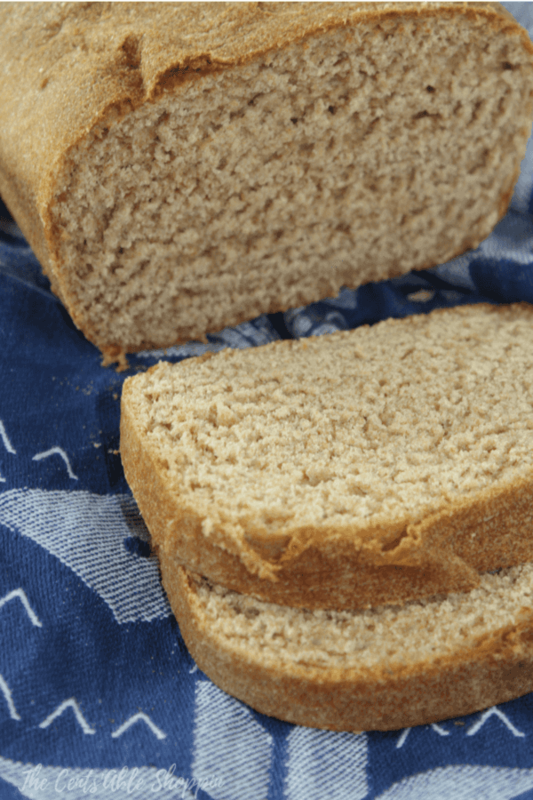 This 100% whole wheat loaf is a delightful combination of hearty wheat, in a fine grain bread with a touch of sweetness. Combine your lukewarm water and yeast in the bowl of your KitchenAid mixer, and allow it to sit for 5-7 minutes to proof. You should see a nice, thick foam at the top - if not, discard and start with new (fresh) yeast. Add the maple syrup or honey, oil, salt, dried milk powder, along with the wheat flour - one cup at a time until you reach 3 cups. Using the dough hook, stir just until combined - the dough should be moist but should pull away from the sides of the bowl. Determine if you need a little more flour - though don't go with too much or your loaf will be dense. Your dough should be moist and rather sticky. Take the dough hook out of the mixer at this point and set it to wash in the sink. 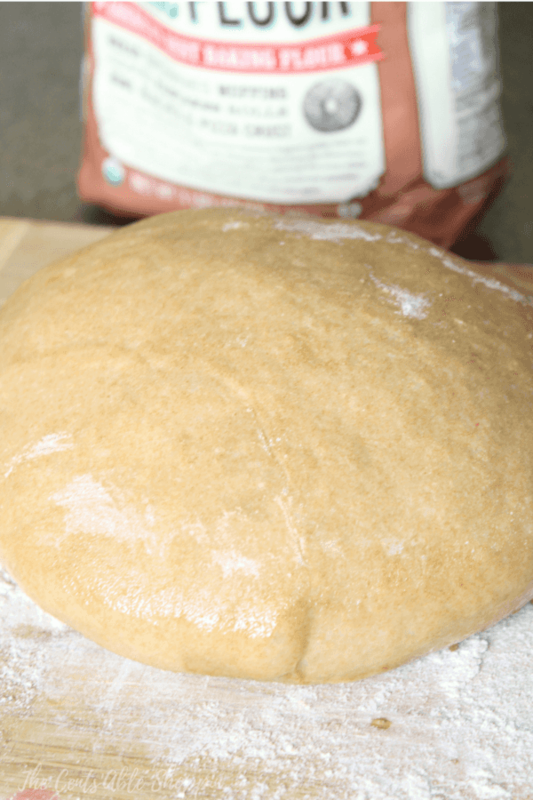 Allow the dough to sit, untouched, for 15 minutes - this gives it time to rest and soften. After 15 minutes, turn the dough out on a lightly floured countertop and knead for 3-4 minutes until soft & elastic. Place the dough in a medium bowl, greased liberally with a little olive oil. Cover with a little plastic wrap and allow to rest, untouched, for 1 -2 hours. The dough may not double in size but it will be puffy. At the end of the rise, turn out onto a lightly oiled surface, and shape it into a 8x12" rectangle. Fold the dough like a letter - left and right side in, then top over, then bottom over. Place the seam side down into a 8 1/2 x 4 1/2 greased loaf pan. Brush some oil on a little plastic wrap and place the wrap on top of the loaf pan and allow the bread to rise 1-2 hours - or until the center has crowned about 1 inch above the rim of the pan. When you are 15-20 minutes away from the end of the second rise, preheat the oven to 350 degrees and move a rack to the middle of the oven. Once the bread is done rising, remove the plastic wrap and transfer to the oven to bake for 30-35 minutes. The finished loaf will be hard on the outside and sound hollow when tapped - the internal temperature should read 190 degrees. Allow the bread to cool, then turn out from the bread loaf pan. Store in a gallon size Ziploc bag.